The Carmignano territory stretches through the graceful Montalbano hills, an area vaunting numerous hamlets that form its unique identity, including Artimino, Bacchereto, Comeana, La Serra, Poggio alla Malva, Santa Cristina a Mezzana, Seano and Verghereto, not to mention the town bearing the name same. The Carmignano area is dotted with villas and churches of great artistic value, some of which house remarkable treasures. Once you’re here, don’t miss the 13th-century Church dei Santi Michele e Francesco in Carmignano, housing one of Pontormo’s most famous works, the Visitation. Also worth visiting is the Parish Church of San Leonardo, located at the old city gates of Artimino; it’s one of the most important works of Lombard Romanesque-architecture in Tuscany. Last but not least, be sure not to miss the beautiful and austere Abbey of San Giusto al Pinone. Among the many features of the Carmignano area, you’ll find a variety of grandiose residences, among which are the striking Medici Villa of Artimino, also known as “La Ferdinanda,” and Buontalenti’s 16th-century Villa di Trefiano. The surrounding countryside is full of valuable archeological finds, such as the Etrsucan tomb of Montefortini in Comeana, the Etruscan necropolis of Prato Rosello, Pietramarina and the Archeological Park of Carmignano (in Artimino). 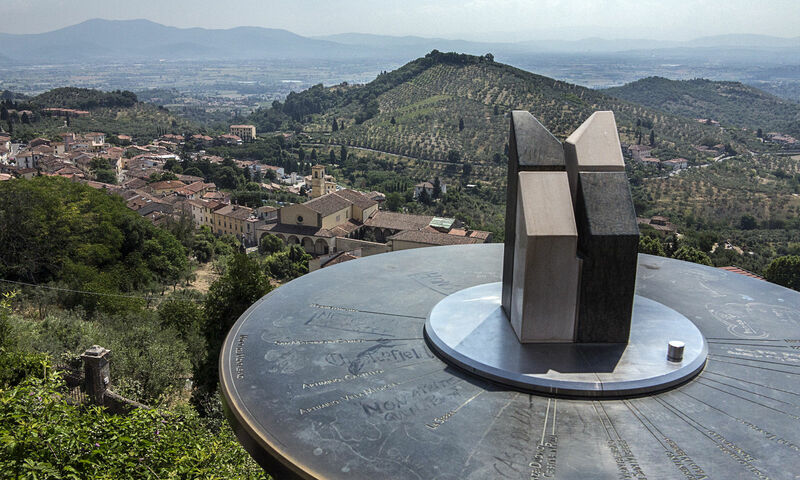 But around here, even modern art-enthusiasts have something to enjoy: in Seano, you’ll find one of the most beautiful open-air sculpture gardens in Europe: the Quinto Martini Park Museum. You can’t visit Carmignano without indulging in a few local delicacies: you’ll find several trattorias offering dishes infused with the ancient flavors of traditional cuisine. Be sure to try one of the excellent wines produced in this area, whose history you can discover (starting from the most renowned Carmignano DOCG) in the Museum of Grapes and Wine. If you’re someone that needs an excuse to go exploring, here’s your chance: between the end of September and the beginning of October you can visit the traditional Festa di San Michele, an event that culminates in the popular Palio dei ciuchi, where the four town districts donkey-race in the center of town, the piazza del Comune.